This work that we all make — these little fragments of digital ephemera — well, I think it's important. Over the years that work builds up into a picture of you and your career. So when you lose something due to a hard drive crash or similar, it's heart wrenching. Even if it's not even work related it still matters — maybe even more so. For that reason I'm a bit of a nerd when it comes to backing this stuff up. I never cease to be amazed when people tell me that their work all resides on just one laptop. A laptop for God's sake — that thing that can be left somewhere, easily split on or stolen. Below is my take on backing-up based on my Mac setup, though the same principles can apply for any system. It's not perfect but it works and it has saved my bacon more than a few times. Remember, backup after the fact is not really an option. In backup parlance there's a thing called 3-2-1. That is, you should have three copies of your files — two locally on different devices and one off site. Here's how I have that setup. Apple's own Time Machine works really well for backing up files and I've used it a few times to resurrect files that have either been corrupted or deleted. For many years I used Apple's Time Capsule but I found these less than reliable, so after having two of these failed on me I instead now use an Apple Airport Extreme with a 4TB drive plugged in. It's this that Time Machine uses to backup to. The great thing about Time Machine is it's over the Wifi so is great for laptops — no need to plug an external drive in, just have Time Machine backup in the background. Time Machine not only backs up my main Mac every hour, but also the drive I use to archive my work — a 16TB Drobo drive. It's formatted as a 16TB drive but right now there's about 2.5TB of files on there. I've had this Drobo for almost ten years and it's been brilliant. It's the 2nd generation 4 bay version that uses a system called BeyondRaid that acts like a raid drive, copying the data over several drives for better redundancy. If a drive fails in the Drobo you just simply swap for a new one and it carries on as before. I can't recommend it highly enough. Imagine you come to your computer one morning and it won't start-up. The Hard Drive is dead. Yet you've got that deadline today and you need to get things done. What now? 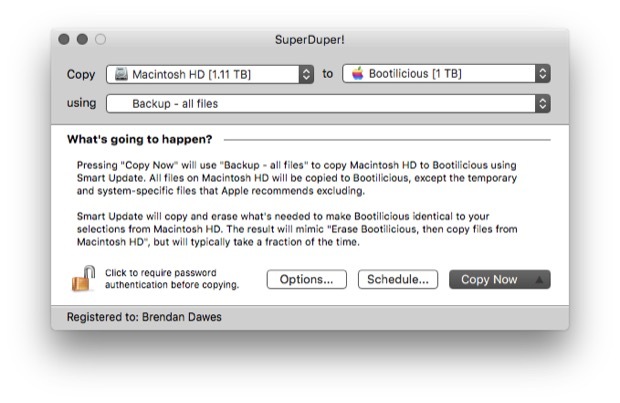 For this reason every night I use Super Duper to make a bootable clone (local backup number 2) of my Mac to an external drive which I call Bootilicious (sorry). If the worst should happen I can boot from that drive (by holding down Option on startup) and carry on with my work, using that drive until I get the main hard drive sorted. Of course this also serves a nice backup of my Mac in addition to the Time Machine backup. So far I've covered backing up files locally, but should something happen in the place where those copies reside (fire, theft etc) then it's really important to have an off site backup to another remote place. There's several solutions out there but the one I've been using for many years is Backblaze, which will backup all your files to their remote data centre for $5 a month. Should the worst happen and you lose files or an entire drive you can either restore online via their web interface or they will send you a physical drive for a fee. Like Time Machine, Backblaze works in the background backing up any drives you specify, apart from Network attached drives. Remember though the first backup of all your files will take a while depending on your broadband upload speed. We're talking days here for lots of files, but once it's done it just updates the files it needs to. One thing to mention — for any remote backup system make sure it is GDPR compliant for when the regulations come into effect on May 25th. If you fancy spinning up your own remote backup solution, using devices that are totally under your control, you might like to look at Resilio Sync, which used to be Bittorrent Sync. For a one-off fee you can set up a peer-to-peer network that will sync any number of folders across all connected devices. You might decide to work something out with a friend were you sync data to each others machines, creating your own remote backup solution. Whilst I dabbled with Bittorent Sync when it first appeared I've not tried it since Resilio Sync took it over. I love Dropbox and it's a big part of my workflow. There has been occasions were I've used their file versioning to rewind a file simply and quickly but I don't consider it main part of my backup as I have files elsewhere that don't reside in Dropbox that I need to be backed up. There's one other part I should mention that gets run once a week, and that's backing up all my sites from a remote server to a Dropbox folder. Yes I have all these sites locally but for brevity I make this backup once a week, which also includes any MYSQL database dumps as well. To do this I chanced on this great post by Matthias Reining which details how to use a Bash script used with a script called Dropbox Uploader to make a carbon copy of my server. This runs via a cron job on a Sunday night, making a zipped up carbon copy of my server, automatically uploaded to Dropbox — and of course it then gets backed up like any other file too. This will make a backup copy of everything I do in Vim, saved in this instance to a hidden directory .backup in my home directory. If you do one thing from this list I would suggest implementing the off site backup, either using Backblaze or a similar service. It's easy, it's cheap and could very well save those precious files you thought were lost forever. Love @ResilioInc sync. Keeps my Macbook and Mac Pro in sync, even when I’m working abroad.